The March 2013 issue of ProNetwork News is the second installment of a two-part article; the author, Tim Corbett of SmartRisk explains the origins and principles of project coverage and introduces the reader to two of the four main types of Project Insurance. 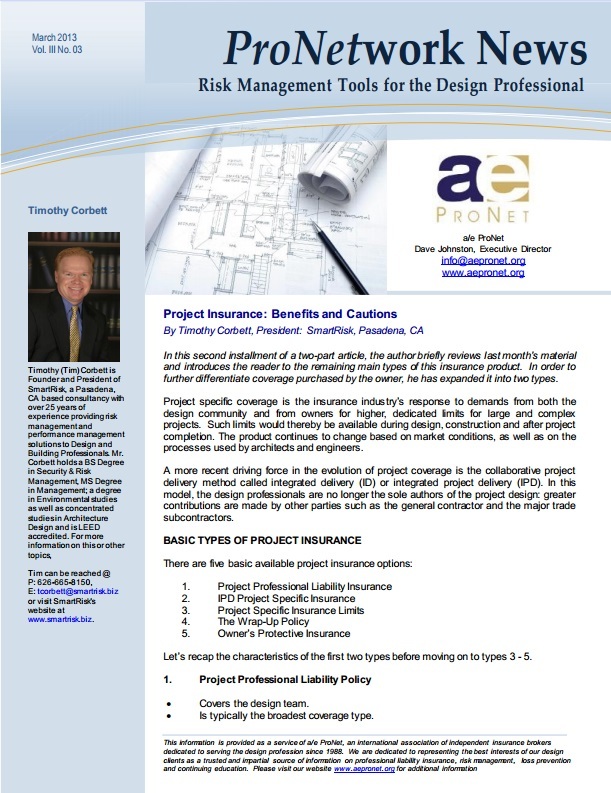 For a recap of the first part, including details about types 1 (Project Professional Liability Insurance) and 2 (IPD Project Specific Insurance), download the full March issue, or, better yet, download the February 2013 newsletter here. Now, let’s examine the remaining three types of project coverage. Sometimes, contracts demand that design professionals carry a higher limit than they usually do. This can occur on any kind of project, but is more common on larger, higher risk projects, and more recently, on public ones. One of the more common strategies for obtaining increased limits for a project is through a Project Specific Insurance Limit. This is provided by endorsement through your current practice policy insurance carrier. 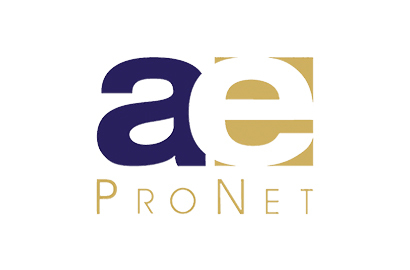 Provides a higher limit for the firm, for a specific project only. Can be more cost effective than raising the limits on the entire practice policy. Makes the cost of the project-specific limit a reimbursable expense. Having a project specific increased limit may not always be the best strategy, and it may not even be available from your practice policy carrier. From an insurance company’s perspective, comparing construction costs to policy limits is part of the underwriting process. Construction value and requested limits may not be in line with the insurer’s potential exposure: those higher limits requested could place a target on the design firm’s back. The insurer doesn’t want to provide the higher limits that could be used as a cost recovery strategy. Ensure that requested limits are in line with exposures and construction costs. For example, is it necessary to require a $5 million limit of professional liability insurance from a firm performing services on a $20 million project? Contact the contract administrator, and state that your firm normally carries a lower professional liability limit than requested, and that it is consistent with industry practice. Inquire if your current limit will be acceptable. To find out more about types 4 (The Wrap-Up Policy) and 5 (Owner Protective Insurance Policy or OPIP), download the full March 2013 issue from our website. About the Author: Timothy (Tim) Corbett is Founder and President of SmartRisk, a Pasadena, CA based consultancy with over 25 years of experience providing risk management and performance management solutions to Design and Building Professionals. Mr. Corbett holds a BS Degree in Security & Risk Management, MS Degree in Management; a degree in Environmental studies as well as concentrated studies in Architecture Design and is LEED accredited. For more information on this or other topics, visit the SmartRisk website or email Tim at tcorbett@smartrisk.biz.